A mailing list is a list of recipients for your email or text messages sendings. A mailing list is not dynamic: you decide who you want to add or remove. 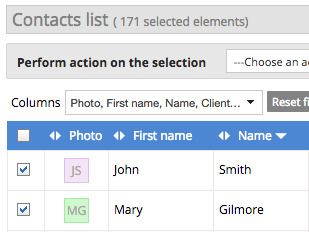 Note that you can also add contacts to an existing mailing list. Important: contacts are automatically deduplicated when added to a mailing list. You can be sure that no contact risk receiving the same message several times. To view and edit your mailing lists, click on the Marketing menu in your Sellsy interface. 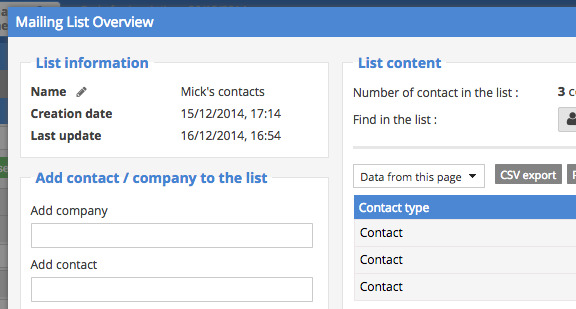 The preview allows you to view your list and to search, add or delete recipients.